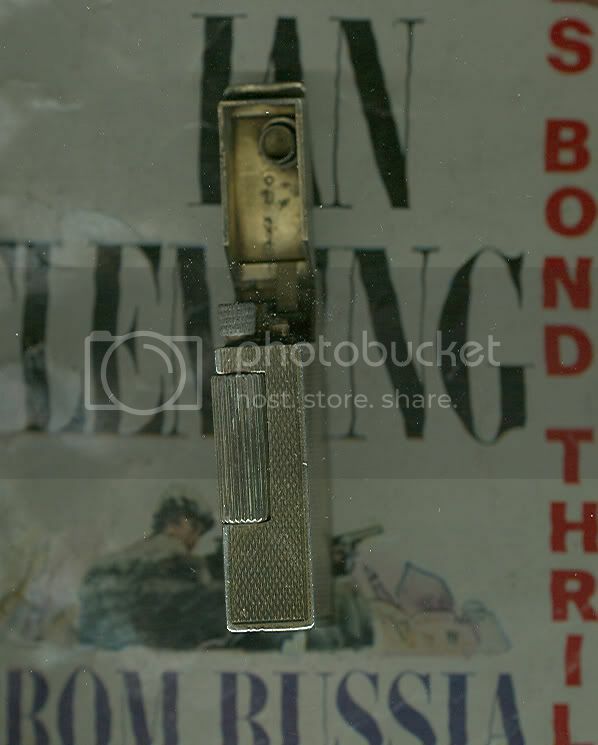 Can anyone help me in finding a similar lighter to the on Bond used in Dr.No? I have searched around but can't find a Ronson rollagas or a Dunhill or Dupont lighter I can afford as these sell for around £200-£300. If anyone out there has one similar could they please post here. Thnaks for the reply, I actually have the first link on my items being watched in ebay. got any idea what type of cigarette case was used? Was it just flat gunmetal? LOL, also being watch in my eBay! 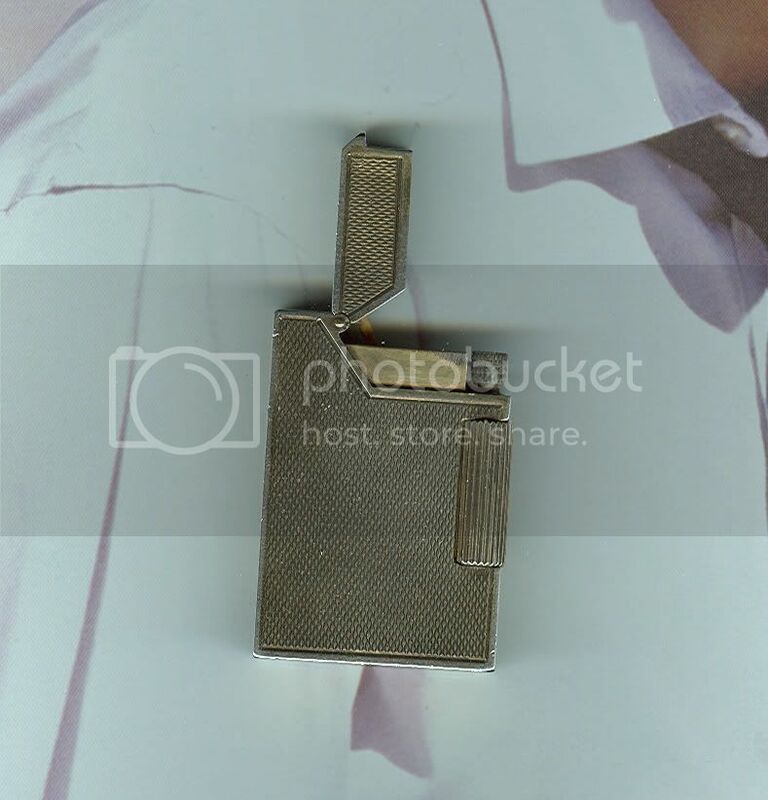 From the look of the lighter and case in Dr.No, just watched the DVD, they appear to both be plain but plain ones don't seem to be made anymore, do you have a Bond lighter and cigarette case bladerunner? so is there a dininative brand that 'is' Bonds lighter? 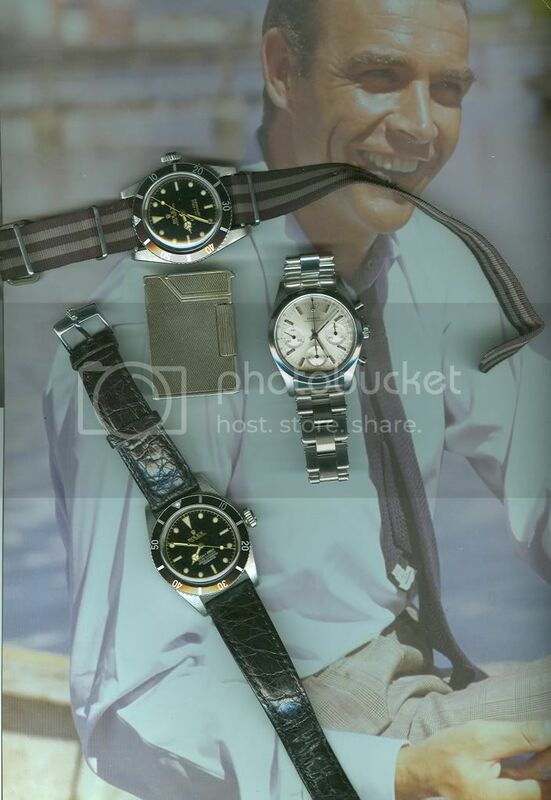 Well, I just purchased one on ebay that has a very gunmetal, Dr. No look to it, but it is a Rollagas version. It's a great lighter that works every time, and I got it pretty cheap for a real Dunhill (confirmed by a local retailer). In Dr No, Connery uses a silver Dunhill Wideboy, with oxidised finish. This was custom made just for the film, after the producers accidently came across a custom order at Dunhill from a customer. Blade is right, the case was also Dunhill. Your lucky you got that, it exactly what I'm looking for! Thanks for the link Carlo, thats a nice lighter! Well, I nearly had it - the Dr. No Dunhill. Someone decided to snipe my bid in the last 15 seconds (I hate bidders like that). Isn't that the nature of an auction? to bid and be outbid? 15 seconds is a reasonable amount of time to get a last bid in..it doesn't mean you were sniped. Well, there are some auction websites that have waiting periods between bids when it comes within a certain time of the auction close. Gunbroker, for instance, has some policy within 15 minutes of close. In my opinion, 15 seconds is a snipe. It wasn't even enough time to refresh my browser, type in a new amount, then press "Yes" and "confirm." But its not illegal so what is the problem? Its no different to someone putting in their maximum bid and then winning the auction..is it? There's no problem. I'm just venting that I didn't reload the browser quicker. Such is life, and I'm just kicking myself, being an experienced eBayer and not acting quicker. 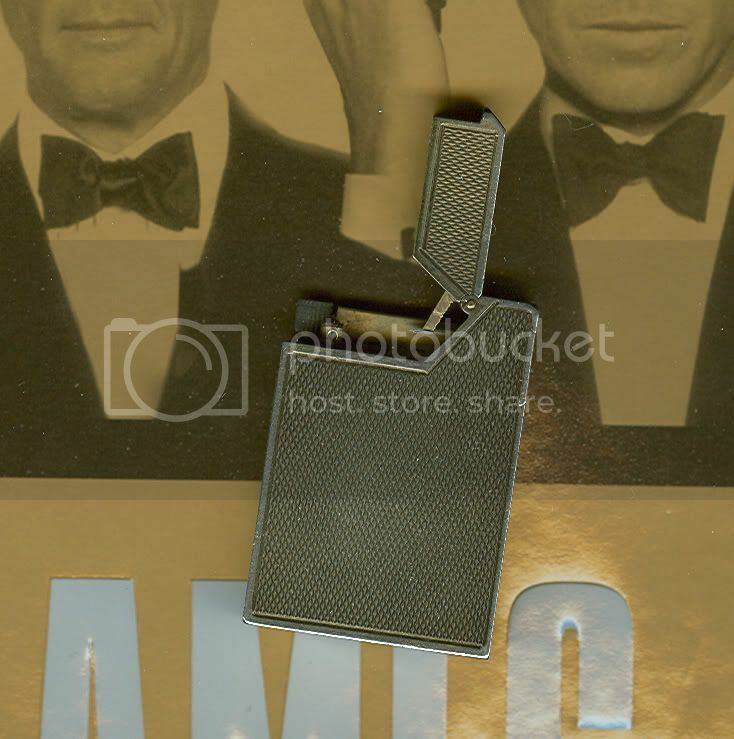 I don't mean to bring up an old topic (actually, I do), but has anyone found the correct Dr. No/Goldfinger lighter yet? The auctions listed ended years ago, including the one I missed out on (which was the correct lighter with a different finish). Has anyone gotten one in that time? I have a Dunhill Rollagas with a high-polished nickel finish that looks like shiny-black in the right light. You could always have it oxidised by a jeweler if you want. Let me know if you're interested. It's never been carried, original box and papers - I'll even throw in 10 packages (90) of flints! It retailed for about four hundred but I'll let it go for $250.00. I've ben trying to sell it for a while now; quit smoking and I don't need to be tempted by the fine accessories! I believe it's a Dunhill Broadboy MK2, with full cap. The half cap is the earlier, MK1 model as I've seen over the Japanese yahoo auction sites I've had to hunt for this stuff. Good hunting, and please let me in on a deal. It of course needs to be oxidised by my jeweler, but other than that, this is the lighter that Connery and Lazenby used. It's hard to tell from movie close-ups if the lighter had an engine turned finish, or was smooth, but with oxidation it will be a perfect match. Also, since it's so rare and hard to find I feel very lucky to have found it. Alright, alright...I just want to know when I can see it in person...first watches now this...I am going to live through YOU! Any time Dave. Although the Christmas season is rather booked. I forgot to mention that the lighter is sterling silver with a nice patina. It looks sort of gold or brassy in the photoraphs, but it's not. You are quite welcome. I've been looking for it for a very long time. 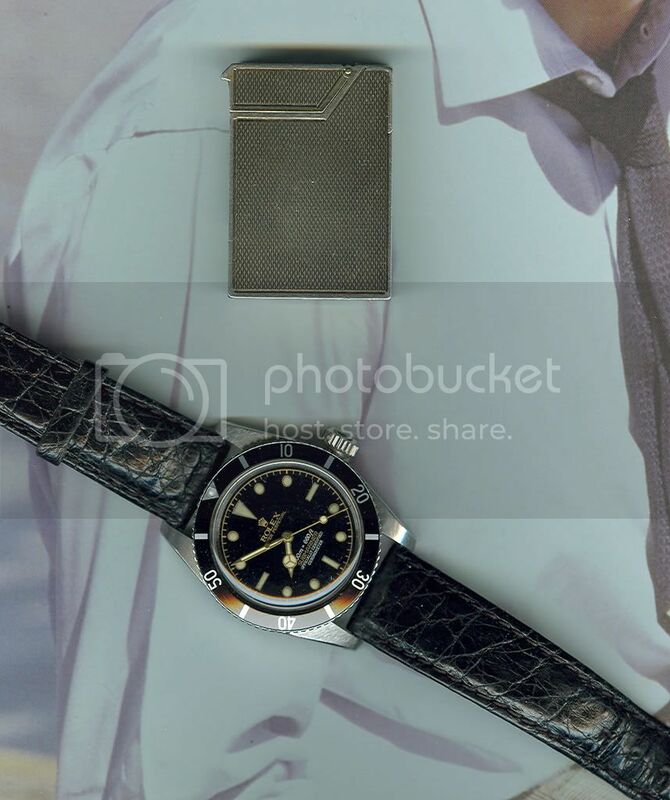 Would you mind giving me the name of your resource (s) for vintage Rolex Sub's? Thanks in advance! Apart from that, I also have a good watchmaker who can secure watches for me at somewhat of an an isider price, if you can call it that. No matter how you slice it, vintage Rolex is just damned expensive.